Most people who visit Thailand are impressed by Thai massage because it is so different. Western massage generally does not use much stretching, whereas Thai massage is sometimes called “lazy man’s yoga”. Some of the positions can be quite challenging, and they are often similar to yoga positions. There are forward bends, back stretches, spinal twists, traction moves, and leg stretches, all in many variations. Massage in Thailand is a very different experience from the west where massage is done behind closed doors in a private room, with clean sheets, soothing music, and a professional and licensed therapist. In Thailand most massage shops look very different. Some are out in the open with just a roof over the area or even on the beach. In many shops you can see the massage happening through a window while you are walking by on the street. Since Thai massage is done fully dressed, there is nothing revealing to be seen. Massage in Thailand is not a very private affair. Generally there are many floor mats right next to each other and often the therapist has to squeeze herself between you and the next client to be able to work on you. There are other clients waiting for their turn while watching all the massages in progress. The therapists are often engaged in lively and loud conversations with each other while they are working on you. And don’t think they are talking about the benefits of massage – they are chatting about food, their relationships, the news, and the latest gossip. If their mobile phones ring, they often pick them up and talk with one hand and keep massaging you with the other hand, or they might just interrupt the massage while they are chatting on the phone. They will often strike up a conversation with you and ask you where you are from, what your name is, if you are married or have a girlfriend. This last question is very important, because western boyfriends are highly prized. 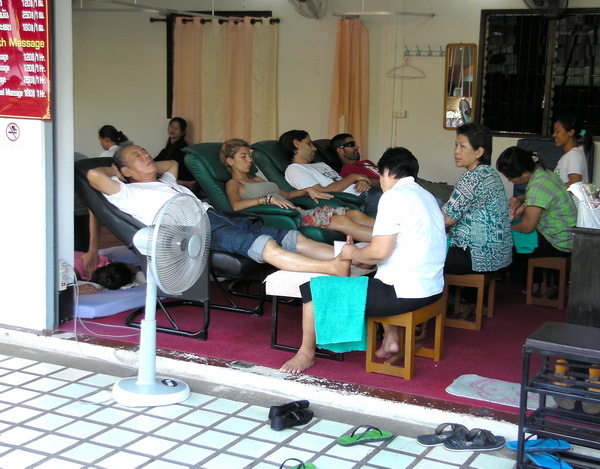 All Westerners are thought of as wealthy, as a ticket to a better life, and many relationships have started in massage shops. If you are willing to keep chatting, the conversation might go on through most of the session. Sometimes cross conversations develop with the client who is lying next to you. The entire scene can resemble more of a social event then a more clinical Western style massage. Although there are licensing requirements for massage therapists,they are not strictly enforced, like many laws in Thailand. Most therapists have little training compared to their Western counterparts. Some only took a short course of a few weeks. This is slowly changing now with the Thai government trying to increase the standard of massage and requiring more education. If you get a massage, ask the therapist how long he or she has been practicing. You don’t want to be the guinea pig of a new therapist if you want quality work. If you are just going for the fun of it and the social atmosphere, then don’t worry. Most Thai massage therapists give a “one size fits all” massage. They follow the same sequence of moves and there is not much room for intuitive, creative or truly therapeutic work. Many therapists take to this profession because it is easy to get into, can be learned rather quickly, and pays reasonably well compared to other jobs. It is a good sign if your therapist asks you questions about your state of health, or how you like your massage (easy, medium, or strong) versus just asking you to lie down and starting the routine. Because of the social atmosphere in many shops, the therapists sometimes do not focus all their energy on you, the client, because they are busy chatting or talking on the phone. As a result, the massage can be quite mechanical. Try to observe the massage in a shop for a few minutes and get a feel for the atmosphere. Ask the therapist if she is using her phone during the session, and make it clear if you have any preferences for your massage. I often go to one foot massage shop here in Chiang Mai. There is a TV behind the therapists, and it is always on. There are Thai soap operas, football games, Thai MTV, and movies. In order to be able to watch the TV, the therapists keep working on your feet while they are turning their heads to catch the action on TV. But I have to admit that it is one of the better quality foot massage shops in Chiang Mai. Go figure! In the better shops, the owner does not allow talking on mobile phones during sessions, and conscientious therapists realize that this is not a professional way of working. There are really excellent therapist in Thailand, and the best way to find one is to ask others about their experience. Many visitors or expats have tried many therapists and can give you good advice about their favorite one. If you are looking for a quiet and private massage experience, and you are willing to spend more money, look for a shop or spa where you have a private booth (the therapists cannot chat with each other). Make sure that the phones are turned off (the therapist’s and yours). Find a therapist who speaks enough English so that you can communicate what you want and be understood. Request an experienced therapist and state clearly what kind of massage experience you are looking for, i.e. do you want to relax, do you have a special therapeutic need, do you like it soft or strong, do you like stretching or not. Make sure to give feedback during the session. If it feels too strong or it hurts, say so. If you want more attention to a particular area of your body, say so. Good therapists are always harder to find than your average variety. If you find one, stick with them, appreciate their work with verbal recognition and a good tip. Despite my reservations about mediocre therapists and suggestions about getting a better quality massage, I have to admit that I have received some incredibly good massages in strange settings – on someone’s back porch, in an open air massage shop in the middle of a noisy market with music playing and roosters crowing and food frying next to me. Thailand is not a place of strict rules, and sometimes the most unlikely things can happen here – it is part of the magic of Thailand and a reason why millions of people come here and many thousands decide to stay. Is Massage Therapeutic or Relaxing? I like the article Shama, good advice. I was so fortunate to have my friend Guy Harriman tell me the good places to go. Do you know Guy? He lives part time in Chiang Mai. However the best one I experienced was by a blind girl at the school in Chiang Mai. It was very different and much more intuitive than the others I experienced. Can’t wait to come back some time. I am not familiar with Guy Harriman. Is he on facebook? I am planning an article on blind massage in Thailand.